“- We want to try the mechanics and the dynamics before launching the final version in order to offer a quality, fun and playability level as high as possible. - It is the best way to integrate the feedback of the community into the game. At the end, the product is for you. “- If we get enough resources to hire more team members, about 3 - 6 months more. “- The 0.4 version represents about 40% of the game. V 0.1: Bunker construction – Construction menu, rooms and hallways. V 0.2: Bunker destruction – Planes, bombs and attacks. V 0.3: Defences – Defences construction & management. V 0.4: Upgrade machines & bunker management top off – Improvements, quick access menu & corrections. Version 0.4 will include the content of the Early Access. The complete product will consist in the V 0.4 and the following. V 0.5: Multiplayer I – Multiplayer maps & structures. V 0.6: Multiplayer II – Multiplayer AI, game modes. V 0.7: Community – Mod support & documentation. V 0.8: SP Campaign – Campaign creation & tutorial. “- Through the early access version and direct feedback from the community: Being in touch with the community from the beginning of the creation process of the game is very important for us. We do not want to create just a game; we are willing to create a product that remains in the memory and in the hearts of anyone who enjoys it. We released a new tutorial video series. Short videos about specific features of the game. 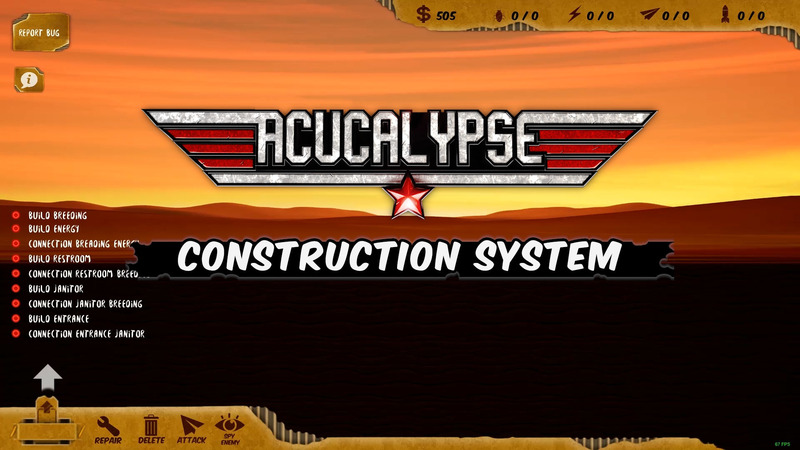 In the first chapter we show you the Construction System. You can learn how to place rooms, build corridors or the delete and repair tools. Soon, other chapters with other features like resources, defences, attack system and much more! Feel free to leave a comment, suggestion or any kind of feedback!! © 2017 Acucalypse, Acucalypse logo, Trifulca Force & Trifulca Force logo are trademarks of Cartucho Games S.L.